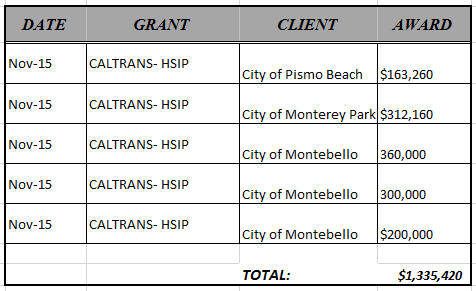 California Consulting Clients Receive HSIP Awards Totaling Over $1.3 Million Dollars - California Consulting, INC.
California Consulting is pleased to announce our clients have received multiple awards for the Highway Safety Improvement Program totaling over $1.3 million dollars. We are especially proud to say that the City of Montebello received 3 of these awards to fund a variety of projects. California Consulting LLC is the state’s largest grant writing firm. Since 2004, it has successfully written over 670 grant applications. Through a combined effort, California Consulting has secured over $1.5 billion dollars for its clients.